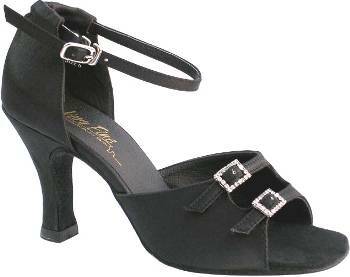 Woman's dance shoes with suede soles, and the front of the shoe is ADJUSTABLE to fit your foot. If your feet are narrower or wider than normal, then these are for you. Woman's dance shoes with suede soles. This is an open toe shoe available in 2.5" Low Heels and 3" High Heels. PLEASE NOTE: These shoes are available from stock. They are usually shipped within 2 days. The shoes are 100% guaranteed (even including your shipping and handling costs). Click here for more info.